Amazon and Jeff Bezos are all set to take over the world – in their typical way – Slowly. With the announcement of AWS DevPay today closely following SimpleDB announcement last week, the game is getting interesting by the hour. With the rapid commoditization of hardware and to a large extent software, the power is shifting away to the periphery. DevPay will accelerate the shift and making it sustainable too. SimpleDB announcement just commoditized the structured data storage landscape dominated by RDBMS majors Oracle, Microsoft and the like. Opensource is a key driver in the rapid( or runaway) commoditization of software. More and more software vendors are looking at Software as a Service(SaaS) model as a way to guard against the opensource onslaught. 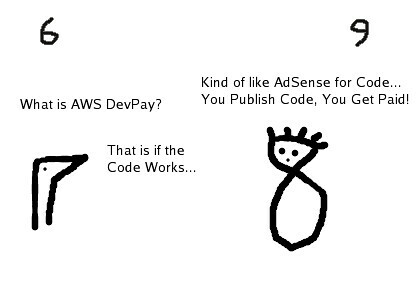 Amazon’s DevPay is a swim with the (opensource)current strategy. Now you don’t have to be the unique – Ridiculously Possible – Obvious Inc to be profitable AND OpenSource. Most people will be happy to pay up for the hosted service and rather not dabble with the code, building it and deploying it. The reduced financial friction offered by Amazon DevPay will see interesting services offered by garage startups challenging the incumbent players in every domain possible. This is a good opportunity for Indian (2 peeps garage kind)startups, especially when the (Indian startup) ecosystem is not mature enough to nurture them cross the ‘infant mortality’ barrier. The opensource code and the operational service can be easy way to gravitate co-founders and talent their way – while they work up some cash flow. The DevPay, it is said, will be extended beyond S3 and EC2. That is very interesting. While the outlook is very rosy, all is not rosy with AWS for non-US developers. While it makes a lot of sense for Amazon.com(ecom) be region specific, why should zeros and ones manipulation be restricted across borders/currency? I know there are valid legal issues that warrant these restrictions. But at the end of the day, it is not enticing enough for non-US developers. Larger (opensource)codebase and larger developer skill base is a strategic advantage for AWS to keep the competition at bay. Till it becomes enticing for developers at every nook, the take over of sky will be sure yet Slow! This entry was posted in amazon ec2 and friends, Amazon Web Service, Entrepreneurship, opensource, Startup, technology, technology as innovation enabler and equity enabler, Web 2.0 and tagged AWS DevPay, AWS SimpleDB, Jeff Bezos, Obvious Inc - Ridiculously Possible. Bookmark the permalink.